Sunday morning 14 of us attended mass at Notre Dame Cathedral. It was the Gregorian chant service and very impressive indeed! The picture was taken looking back at the open doors of the cathedral at the end of the service. 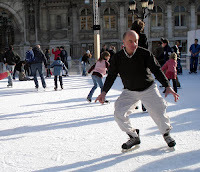 Then your author wandered over to see the skating rink in front of Hotel de Ville, or City Hall. This older man was skating in a reverie, marking out the skating moves he used to perform more fully. It was very touching. The afternoon was open for the required museum visits. Either the Louvre, Musée D'Orsay or the Cluny Museum could be visited, plus one additional. 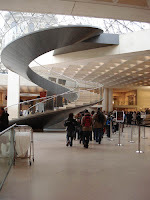 The picture is of the wonderful spiral staircase entrance to the Louvre from the Pyramid. Others chose to visit the fabulous collection of Impressionist paintings at the D'Orsay.